PRODUCT RATING Pretty Good, without dish detergent, when used for washing dishes that are not too greasy. Just Ok, with detergent, for dirty dishes. Excellent when used for wiping countertops. A superior product for many uses, but does not replace a sponge with an abrasive pad for hard-to-clean dishes. GREEN RATING Light Green to Quite Green depending on the manufacturing process chosen by company. Made from 100% bamboo fiber. Durable. The anti-bacterial quality of bamboo means you can go without detergent for light cleaning. (note: there is some controversy about whether the anti-bacterial quality of bamboo remains after going through the manufacturing process.) The Noesis brand cloth is certified organic. AVAILABLE AT Club O. They are sold by two Hong Kong companies (Noesis is one, the other I can’t remember the name) usually at booths in malls or shopping areas. Also sold at Mai Po Po in Fan Ling during their local organic farmers market on Wed and Sun. For wiping our dining table and kitchen counters, we used to use the ubiquitous Scotch-Brite Kitchen Wipes. These are the ultra-thin, blue striped, perforated cloths that seem to occupy every home. From a user perspective, I have always been dissatisfied with them. Firstly, they are too thin to be held properly when wiping something down and have a very unsatisfying, disposable feel to them. Then after a dozen or so uses, they get that squishy feel that is really quite gross. You start to wonder, what kind of germs are brewing in that moist, mushy cloth. The cloth then eventually starts to smell, as if to confirm your initial fears. Although they are advertised as washable, who feels like putting something like that in the wash with their clothes? Since they are so cheap and because no one wants to wash them, I suspect most of us end up throwing them away before the end of their useful life. Minimizing the use of disposable items, that over a lifetime clog up our landfills, is a key principle of living sustainably. In addition, these wipes are produced from petrochemical derivatives making them inherently unsustainable. We also avoided the use of a cotton dish cloths because cotton is one of the most environmentally unsustainable crops. Although advertised as natural, the growing of cotton today constitutes 25% of annual worldwide insecticide use, while only occupying 3% of agricultural land. The land on which conventional cotton is grown is a dead zone, no other plants, animals or insects can survive on it. Bamboo on the other hand grows rapidly and naturally without any pesticides, herbicides or fertilizer. It has a massive yield per acre and is probably one of the most sustainable crops in the world. Bamboo, like trees, also sequester CO2. The bamboo cloths reviewed here are sold for washing dishes, but we also use them for wiping tables and countertops. For this use, they have many advantages that make them simply superior to both Scotch-Brite wipes and cotton cloths. The first thing you notice when you touch them is the thick, quality feel that just feels just right in your hand. They are soft and absorbent like cotton, but don’t get that super heavy feel when soaked with water. It’s like a cross between synthetic quick-dry and cotton. Even after many uses, they will not get that mushy feel of Scotch-Brite wipes. Due to anti-bacterial and anti-fungal properties of bamboo, they don’t end up smelling either. Since they don’t smell, feel mushy or look like wet napkins, you are much more inclined to throw them in the washing machine. This fact alone makes them last much longer. When used for washing dishes, the bamboo cloth is quite good for cleaning items that are not too dirty. The makers say that you can wash your dishes without dish detergent due to bamboos anti-bacterial qualities. We use the cloths, without detergent, for washing things like glasses, cups and for dishes that have been used for serving fruit, bread, etc. For heavy duty cleaning we still use a sponge pad. There are some instructions for how to use this cloth. First, the makers recommend wiping in one directing so you are not end up moving the dirt back and forth across the surface you are cleaning. They also recommend not wringing water out of the cloth, instead just squeeze the water out, and not bleaching it. We only give this product a Light Green to Quite Green rating because: (a) the dyes used are in all likelihood not very eco-friendly, and (b) we are not familiar with the process employed by these companies for making this cloth. What we do know is that bamboo is clearly environmentally superior to both cotton or fabric derived from petrochemicals. Bamboo is very water efficient which reduces water stress (growing cotton on the other hand is extremely water intensive), it produces a high yield (allowing more land to be returned to nature) and is non-polluting. For the right uses (wiping tables/countertops and cleaning dishes that aren’t too dirty) the performance of this product is definitely superior to the existing products on the market. We are glad to find a product that not only more ecologically sustainable, but also provides improved performance. 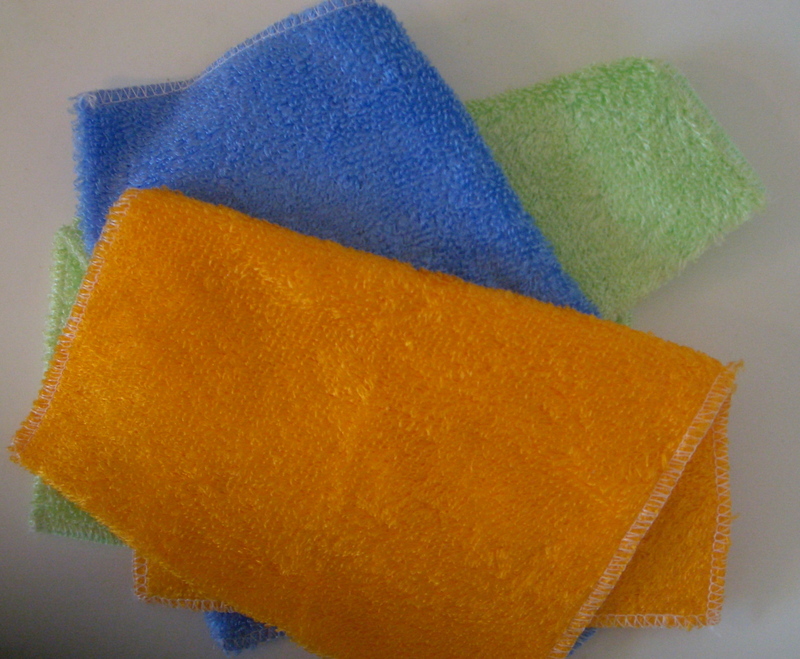 Reusable cleaning cloths outperforms without harming the environment.